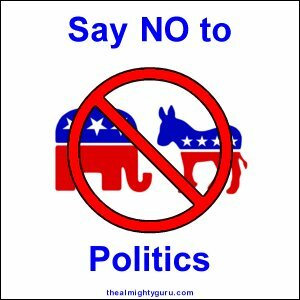 No more politics. . .
One day last week the Holy Spirit prompted me to swear off discussing politics. Something about it being an occasion of sin for me. I heard; I listened. . .and I decided that I'd drunk too much coffee. And quickly forgot about the whole thing. Since I am one of the Lord's thick-headed disciples, I was reminded today why He had "suggested" that I give up this particular bad habit. So. . .no more politics for me until after the election. I'm sticking to preaching and giving out spiritual advice. Don't tempt me. If you do, I will put you on my anti-Novena list. To date, it's a short list. Don't make it longer. Along the way to Capernaum through Galilee, the disciples were arguing among themselves. In their ignorance and fear, they were wrangling with one another, jockeying for position and prestige within the troupe. What were they arguing about? What could disrupt their peace? Jesus started the trip by telling them what was going to happen to him once they got to Jerusalem: “The Son of Man is to be handed over to men and they will kill him, and three days after his death the Son of Man will rise.” We might imagine that this revelation would provoke astonished questions, some howls of dismay or at least a few protests. But the disciples did not understand what Jesus had revealed to them. They were fearful of asking him what he meant. Rather than risk showing their ignorance and fear, they choose instead to argue about who was first among the twelve of them, who was the greatest of Jesus' disciples. When Jesus asks them what they were discussing, they remain silent. Given the absurd nature of their conversation, this was likely their best response. No answer at all. Confronted with the prospect of a bleak future as Christ's disciples—certain persecution and death—the Twelve turn inward and wrestle over insignificant questions of precedence and power. Unwilling to relieve their ignorance by asking questions or assuage their fears by faith, they choose to distract themselves with internal political games. Simeon Weil* once wisely observed, “Imaginary evil is romantic and varied; real evil is gloomy, monotonous, barren, boring.” Faced with the barren boredom of real evil, how often do we open our hearts and minds to the romance of imaginary evil, hoping for something more enticing, more entertaining than what we have been promised as Christ's faithful disciples? Seeing jealous ambition among his disciples, and knowing that they do not understand his fate or theirs, and knowing what selfishness and ignorance can breed, Jesus smacks them with this sobering truth: “If anyone wishes to be first, he shall be the last of all and the servant of all.” If you will be the greatest, you must be the least. If you will be first, you must be last. If you will be the master, you must serve. This truth is of no use to an ambitious soul. No truly political animal can hunt successfully with this truth as a weapon. Jesus not only smacks their jealous ambition with an order to serve, he tosses all their pettiness, all their planning, all their machinations and plotting right into the fire of humility. Jesus knows that no true spiritual adventure can begin in ignorance or fear. It is wisdom and faith that kick us into gear! And only humility can be a wise and trusting guide. 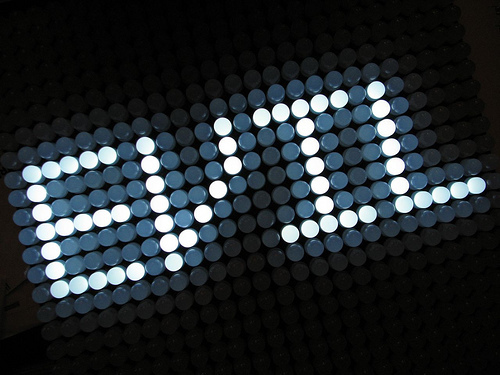 Simeon Weil says that real evil is boring and barren. She adds, “Imaginary good is boring; real good is always new, marvelous, intoxicating.” So, real evil and imaginary good are both tedious and sterile. If we understand the spiritual and emotional dangers of real evil, can we say that we understand the traps laid for us by the imaginary good? If truly good things are “new, marvelous, intoxicating,” then the imaginary good must be familiar, dull, and sobering. If the truly good offers fresh, miraculous, and uplifting insight and possibility, then working with the imaginary good must leave us numb with sedate routine, sluggish habit. The trap of the imaginary good is insidious, perhaps more so than the perils of real evil. Take the disciples as an example. Confronted by the possibilities of Jesus' revelation, they fall back into a familiar pattern of squabbling over precedence. Hearing what lies ahead, as promised, they revert to what they know: infighting over insignificant questions of authority and power. Rather than end the maneuvering by appointing a lieutenant, Jesus shows them the power of a real good—a new, marvelous, and intoxicating possibility: leadership as humble service. Rather than paint an improbable vista of wealth and prestige for those charged to lead, Jesus takes a child on his lap and says, “Whoever receives one child such as this in my name, receives me; and whoever receives me, receives not me but the One who sent me.” Receiving Christ is not about building monuments or temples or palaces; it is not about filling charitable trust funds or establishing new religious orders. Tossing all worldly expectations and priorities into the furnace of humble service, Christ says that we receive him and the One Who sent him when we receive one child in his name. Just one. Not a whole orphanage. Not even a pair of siblings. Just one child. A tiny act of compassion, a small mercy shown to someone who cannot repay your kindness, cannot owe you a favor, someone who will not boast of your generosity or brag about knowing you. In the eyes of the world, an act of love that wastes an opportunity to move ahead. Exactly. Just so. In their idle arguments about priority, the disciples play at a game that matters a great deal in the world, that part of creation ruled by unrestrained passion and power. They play a game called “The Wisdom of Men.” To be better, then the best in the world, a man's heart and mind must be impure, conflicted, abrasive, controlling, ruthless, negotiable, and insincere. Nothing like the heart and mind of a child. 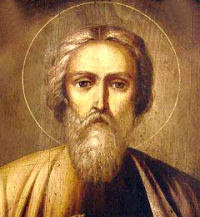 But James reminds us that “the wisdom from above is first of all pure, then peaceable, gentle, compliant, full of mercy and good fruits, without inconstancy or insincerity.” A heart and mind that welcomes divine wisdom exudes quiet confidence, serenity of purpose, eagerness to serve, and a depth of sincerity. Having reached the child-like heights of Christ's peace, anything and everything imagined and done by such a soul is new, marvelous, and intoxicating—truly Good and Beautiful. Earlier I raised the question: Faced with the barren boredom of real evil, how often do we open our hearts and minds to the romance of imaginary evil, hoping for something more enticing, more entertaining than what we have been promised as Christ's faithful disciples? Very few of us will embrace real evil as a way of life. Some of us will toy with imaginary evil as a naughty diversion from what we imagine to be our rutted, routine lives. Most of us believe ourselves to be practitioners of the real good. But are we really just playing with the imaginary good, the lukewarm forms of goodness? Are we just good enough to be comfortable with the spiritual boredom that slowly wets the Spirit's fire within us? Do the wicked say of us: “Let us beset the just one, because he is obnoxious to us; he sets himself against our doings, reproaches us for transgressions of the law. . .”? If the practitioners of real evil do not see us as a threat to their ambitions, then how are we helping them? What are we doing or thinking or saying that gives that world—the world where real evil thrives—more power, more prestige, more wealth? How many times have I heard otherwise faithful, intelligent Catholics say something like: “I've been asking God to give me the grace to forgive/forget/move on/stop this sin/grow in purity/etc. And it seems like He just doesn't hear me”? How many times? If I were given a dollar for every time I heard this, I could buy a complete set of Japanese silk, hand-embroidered, jewel-encrusted, air-conditioned vestments and have plenty left over to start my own fried chicken and pecan pie franchise. That's a lot of time, folks. A lot. Despite the frequency of and urgency with which I am asked about the apparent absence of God's favor in someone's life, I always take the time to answer patiently b/c we're not messing around with an abstract philosophical question here. We depend, totally depend, on God's grace to make it day to day. Forget growing in holiness. How about just getting out of bed? How about just making it to work, to school? “Father, I've been asking God to give me the grace but it seems like He just doesn't hear me. What's wrong?” I answer, quoting Paul, “. . .grace was given to each of us according to the measure of Christ's gift.” Was given. That's past tense. You have already been given the grace you need. Does knowing this truth solve your problem? Probably not. Why? Because the problem is not a lack of knowledge. The problem is most likely a deficiency in the will. Are you using the grace you've already been given? Are you cooperating with all of God's efforts to get you untangled? Let's go back to Paul. What is he telling the troubled Ephesians to do? “I. . .urge you to live in a manner worthy of the call you have received. . .with all humility and gentleness, with patience.” No small order, and we know that Paul knows he's asking a lot b/c he follows his order with: “BUT grace was given to each of us according to the measure of Christ's gift.” So, using Christ's death and resurrection as the measure for merit, we have been given the grace we need to grow in holiness, and that grace comes to each one of us and takes shape in us according to our individual natures so that we might be made perfect. How do we exercise the will to cooperate with the grace we have been given and received? Grace does not destroy my nature; it perfects my nature. If I live a life worthy of the call I've received, then grace gives me all I need to approach perfect holiness. 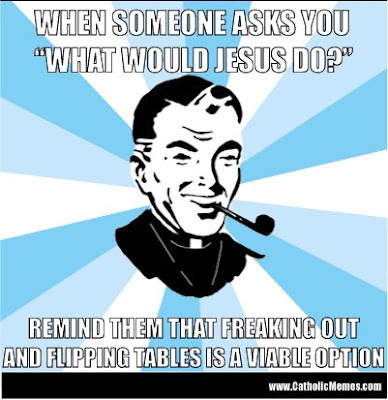 Now, you're probably thinking: but that's the problem, Father, I need grace to live a worthy life! How do I live a worthy life w/o grace? You don't. That you exist in the first place, that you exist at all is a grace, a gift. You live, you move, you breath in the presence of God. To repeat: you already have all the grace you need. Use it. Cooperate with God's gifts and you will approach perfection. Look at Matthew. A lying, cheating, traitorous tax-collector for a heathen empire that's invaded his own country! Jesus looks at him and says, “Follow me.” That's it. What is it in Matthew that helps him to stand up, turn away from his lucrative job, and become a fool for Christ? He sees in Christ his own perfect self; he hears from Christ the word of grace that he already knows will teach him the way to salvation. Something in Matthew assists him in responding to what we sees and hears in Jesus. We call that something “grace.” The next time you find yourself confused by temptation or stuck in sin, don't pretend you are helpless and ask for the grace you already have. Ask for the courage and the strength to use that grace to live a life worthy of the calling you have received. Ask for the courage to be Christ for the world. WWJD. . .with my October calendar? Follow HancAquam and visit the Kindle Wish List and the Books & Things Wish List Click on St. Martin and donate to the Dominicans! Who dares to ration Love? Paul writes to the Corinthians, “Strive eagerly for the greatest spiritual gifts. But I shall show you a still more excellent way.” Seeking out and finding “the greatest spiritual gifts” is a good way to holiness but not the best way, so he intends to reveal to them and to us “a still more excellent way” to holiness. One question: in the pursuit of holiness, what could be better, more excellent than striving eagerly for the greatest spiritual gifts? How about striving for these gift, obtaining them, and then using them for the benefit of others? That's the context of this chapter of 1st Corinthians: using our individual spiritual gifts in the Body of Christ for the benefit of the Church and the whole world. But Paul wants to make it absolutely clear to them and to us that the use of our spiritual gifts is largely worthless unless we use them along with a vital virtue, one fundamental habit that transforms an otherwise natural gift into a supernatural force. That vital virtue, that one fundamental habit is, of course, Love; that is, God Himself as He gives Himself to each one of us so that we might be perfect as He is perfect. The most excellent way to holiness is love. Paul makes this point by setting up several contrasts. Without love, human and angelic voices are simply resounding gongs and clashing cymbals. Without love, the gift of prophecy; an understanding of the mysteries; and all the knowledge there is to know are all worthless gifts. Without love, faith enough to shift a mountain is useless; it's nothing. He writes, “If I give away everything I own, and if I hand my body over so that I may boast but do not have love, I gain nothing.” We gain nothing from our spiritual gifts if we fail to use them with love. We do not progress toward perfect holiness unless we call upon Love Himself to transform our work into His Work. 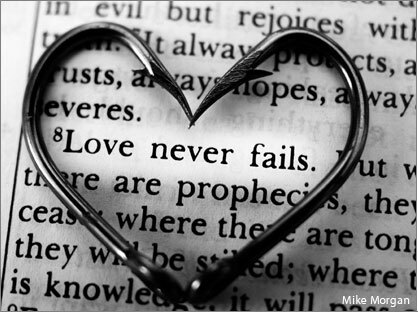 Paul assures us, “Love never fails.” Love cannot fail. And when we pursue the greatest spiritual gifts, obtain them, and use them in love, we cannot fail. Why? Because we become love-like, Christ-like: patient, kind, humble, selfless, even-tempered, forgiving, and rejoicers in the truth. We bear all things, believe all things, hope all things, and endure all things because it is strength of the whole Body that sustains us; it is God Himself who permeates our work for His glory, and fortifies our vision of holiness and our resolve to achieve perfection. Authority. It has become one of the most maligned words in our Catholic vocabulary since the Council ended in 1965. Some Catholics, believing (falsely) that the Council Fathers revolutionized the Church into a participatory democracy, have grown increasingly disappointed that the reforms of the Council have failed to materialize. The villains in this alleged plot to thwart the will of the Council are branded with various unflattering labels. Regardless of the label, the central complaint of the disappointed is always the same, “The Roman hierarchy will not surrender its authority over the Church.” Setting aside the absurd idea that the Council Fathers ever intended to re-establish the Church as a democracy, the real problem for these Catholics seems to be the very notion of authority itself. The exercise of authority implies that the truth can be known. That can be dispute settled or a question answered decisively. Since Christ himself is the Way, the Truth, and the Life for the world, he is rightly recognized one possessing auctoritas; that is, the decisive weight of authority. By his word alone, we are healed. The centurion in today's gospel immediately recognizes Jesus' authority over disease and disability. Drawing a comparison btw his own authority as a military commander and Jesus' authority as the Son of God, the centurion declares his faith in Jesus' ability to command that his servant be healed. Not only is he acknowledging Jesus' authority to heal, he's also confessing that he believes that Jesus can heal his servant w/o seeing him or touching him: “. . .but say the word and let my servant be healed.” Jesus' response to the man's faith is telling. He is amazed, and says to the gathered crowd, “I tell you, not even in Israel have I found such faith.” While those who should be flocking to Jesus—the priests, the scribes, all the people of the Covenant—instead question, argue, and ridicule him, here is a Roman solider, a pagan invader, and occupier among God's own people who sees and hears the truth that Christ is sent to reveal. The centurion sees in Christ the truth of his divine mission, the truth of his purpose, and so he accepts the authority that this truth wields in the man Jesus. There is no way to distinguish or separate Christ's truth from his authority. If we accept the truth that Jesus is the Christ, then we also accept his authority as our Lord. Would he be amazed at our faith, our obedience? After Jesus expresses his amazement at the centurion's faith, the messengers sent to intercept Jesus return to the soldier’s home. There they find that the man's servant has been healed. We are that once-sick and now-healed servant. With the healing word of Christ spoken over our afflictions, our divisions, our contentions, we are healed from the distance of heaven and by this offering at the altar of the cross. Everything we do and say here this evening—our prayers, our gestures; our offer of sacrifice, everything—is worthless w/o the authority of Christ's healing word to make it worthy. We participate—take part in—our own healing by losing ourselves in this sacrifice, by surrendering all that we fear most to lose: pride, control, esteem, a stubborn will; our disordered passions, our disabling vices. Christ will not heal the unwilling, nor can he heal the unbelieving. Like the centurion who confesses the truth and submits himself to the authority of Christ, we too must welcome into our households, into our lives, the Way, the Truth, and the Life, and proclaim that Christ is Lord of all. By his word alone, we may be healed. 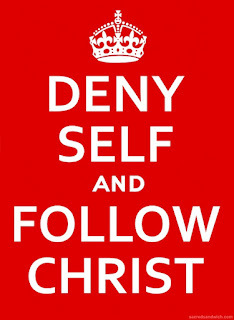 Deny Self. . .Follow Christ! Jesus tells the disciples his fate: rejection, death, resurrection. Peter becomes distraught at this news and rebukes his Master. Does Peter lack faith? Is he lacking in reason? Surely, we can say that even as he rebukes Jesus, Peter is a rational believer. He believes that Jesus is the promised Christ. After hearing Jesus describe his fate at the hands of his enemies, Peters reasons that it would be better for Jesus not to go to Jerusalem. And why wouldn't he make this argument?! Peter loves Jesus, and does not want to see him killed. If all this is true, then why does Jesus rebuke Peter, naming him “Satan”? Peter is not listening; he's hearing, but he is not listening. Peter's love fails him in a crucial way: he has carved his fidelity to Jesus into an idol. Out of his faith, he has carved an idol of Christ that cannot do what Christ came to do. Horrified at the prospect of his seeing his faith upended, Peter rushes to prop up his idol, thinking as men do and not as God does. Jesus teaches Peter and the other disciples how to move from fidelity to Christ to fidelity with Christ: deny yourself. Lest we betray our Lord's mission, we must be faithful along with him, faithful with his divine purpose rather than merely faithful to him as a praiseworthy idol of our love. Jesus rightly accuses Peter of thinking as men do and not as God does. Peter can be forgiven this lapse b/c he is a man and not God. However, his misunderstanding of Christ's mission is still worthy of a rebuke b/c he has—right in front of him—God's final revelation to humankind: Jesus himself. Jesus himself reveals to the disciples the Father's plan for our salvation—rejection, death, resurrection. But Peter still finds the gumption to chastise his Master! Peter is thinking like any friend would, like any loyal student would. You cannot go to Jerusalem to die! Jesus turns on him and calls him “Satan”! Betrayer, Schemer, Tempter. Jesus knows that Peter loves him, but the disciple's rebuke is a temptation for Jesus, a temptation for him to abandon his divine mission out of love for his friends. As the final revelation of God, Jesus knows that he must sacrifice the love of his friends in order to bring about the salvation of the whole world through sacrificial love on the Cross. Peter is a faithful friend to Christ, but he is not yet a faithful apostle with Christ's mission. Jesus' rebuke is meant to move Peter from selfishness to self-denial. He must be prepared to lose Christ for the sake of the world. Deny yourself. Take up your cross. And follow Christ. What must I deny? Where is my cross? And how exactly do I follow Christ? To deny oneself is to lose oneself with Christ and his mission. If I am truly lost in Christ, then there can be no “I” who is faithful to Christ. I become Christ, and wholly lost in him, I am faithful with Christ rather than to Christ. Being a finite creature, the degree to which I am lost in Christ is measured by my obedience, my eagerness to listen to him, and seek his direction. Like Isaiah, I must pray for my ears to be opened. The more I shed Faith as a thing to possess, an idol to worship, and embrace being faithful with Christ, the more I listen, think, and act with the mind of Christ. The clarity of obedience rings true in a soul lost in faith with Christ. The cross I bear is the one thing most difficult for me to lose, the one thing I cling to most stubbornly. Jesus says, “For whoever wishes to save his life will lose it, but whoever loses his life for my sake and that of the gospel will save it.” Perhaps my cross—your cross—is the life we live for Self. Christ died for others, for us. He died so that we might live and live eternally. Are you prepared to die for others in Christ's name? Surely, this is the truest test of being faithful with Christ. What else can he mean by “follow me” than “follow me to the cross and die a sacrificial death for others”? “Follow me” cannot mean “think of me fondly” or “direct prayerful words toward” or “hang a picture of me and kiss it everyday.” There's nothing wrong with thinking fondly of Christ or praying to him or kissing his picture. That is, there's nothing wrong with any these if we also deny ourselves and carry our cross; if we also place ourselves wholly within his divine mission, lose ourselves in his purpose, and bear up under the one thing most difficult for us to surrender. The ever-present danger, the temptation that Peter voices, is that we make of our faith an idol. Christ becomes a star, a figure for distant admiration. We begin to treat him like we would treat Drew Brees or Tim Tebow. A celebrity, a two-dimensional poster boy for good works and tribal bumper stickers. Or a politician, forming a cult around a big personality or a catchy philosophy. Christ is not a star or a politician. Our faith is not a cult of personality. When we are with Christ on his mission we are sacrificial people, a nation of priests wholly given over to the goal of bringing the world into holiness, to giving the gift of creation back to its Creator. Christ died for us so that we might be holy. If we follow him, we too must die for the holiness of the world. How do we begin to die in Christ? It starts small, small steps. James writes, “. . .faith of itself is dead, if it does not have works.” He also teaches us that good works done without the motivation of faith are empty. Here's a small test for you. While you are doing a good work, ask yourself, “Who would Christ say that I am?” Ask yourself, “Am I doing this good so that Christ may be better known?” To what degree are we willing to submerge the Self in doing good and lift up God for His greater glory? The Selfish man will die from lack of attention; he will be transformed into a true priest if he offers his work as a sacrifice for the mission of making this world holy. Deny yourself. Take up your cross. Follow Christ. Follow Christ all the way to Jerusalem and the Cross. To do anything less than this is make an idol of the faith. And like all idols, this one will fall when struck. The Good News is that none of us, not one of us, is charged to transform the world alone. We are a nation of priests, a holy people, the tribe of a loving God. We can do nothing good without Him. NB. The Rev. Br. Monco is a friar of the Central Dominican Province. The Rev. Brs. DeArmond and Schaefgen are friars of the Southern Dominican Province. Fra. DeArmond is a local boy. His family lives in Springfield, LA just outside Ponchatoula, LA. Fra. Schaefgen is from Memphis and a graduate of Tulane Univ. Both the SDP friars were novices when I lived in the senior community in Irving, TX.